A great turn out saw forty three (43) anglers support this latest qualifier. Draw time was later (11am) and fishing was 1pm – 6pm. Surprisingly, carp were all over the surface and it was pellet waggler or pole shallow that sorted out the winners. Winner on the day was Ray Lamb (Maver), who drew peg 87 off the chalet road bank. Ray was fishless for the first two hours, then found carp of size feeding shallow on the pole to pellet. Ray won the day with 99-05-00. 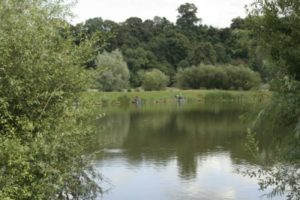 Second placed Mark Jones (Tredegar AC) drew peg 76 and adopted a one hundred per cent pellet waggler attack landing quality carp to 15lbs. Mark finished the day with a level 91lbs. Third placed Fran O Reilly (Maver) completed a successful Larford weekend from peg 68. Fran fished pellet waggler for the full five hours weighing 76-05-00. Fourth placed Andy Edge drew peg 78 landing 75-08-00 to pellet waggler. Fifth placed Paul Cook (Maver) drew peg 89 landing 74-13-00 of carp to 14.5m pole shallow. Simon Harris (Little Dawley) completed the top six with a fine catch of carp from peg 85. Simon also caught on the pellet waggler.